One of the few golf resorts in the UK to boast three championship golf courses, Celtic Manor offers golfers an experience they will remember. Catapulted into the spotlight by the Ryder Cup in 2010, Celtic Manor has been a favourite among UK golfers ever since, the phenomenal accommodation and facilities adding to the allure. The three courses are, of course, headlined by The Twenty Ten following Europe's heroic victory in intense conditions, however, the Roman Road and Montgomerie are great courses in their own right. Located just outside of Newport, surrounded by the rolling Welsh hills, Celtic Manor can be easily accessed by golfers across the UK. For accommodation, the Manor House is the perfect option for those who don’t need the extravagance of the main Resort Hotel but still wish to be within a short walk of all the facilities, restaurants and bars. The 19th-century property is gorgeous inside and out, with its own options for drinking and dining, including the Cellar Bar, a lively sports bar popular with groups. Celtic Manor prides itself on being able to accommodate the needs of every guest and group; check out the Resort Hotel, Coldra Court and The Hunter Lodges for other fantastic accommodation options. Celtic Manor’s Twenty Ten Course is arguably the biggest step forward in the history of Welsh golf. The first course ever to be designed specifically to host a Ryder Cup, The Twenty Ten did not disappoint, seeing an epic victory for Europes and providing now-iconic images of golf’s best players battling it out in the rain. The course more than held its own under the monsoon that fell that weekend, still maintained to that epic standard today. The Twenty Ten Course is now a bucket list course for many golfers in Europe and rightly so, a round here is thrilling from start to finish, invoking those Ryder Cup memories as you walk in the footsteps of legends. However, it is not just the course, but the experience that makes The Twenty Ten so great, being met as you arrive, given your own Ryder Cup locker and shoe cleaning after the round are just some of the things that make it a special place to play. 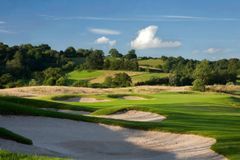 The oldest course at Celtic Manor and a firm favourite among UK golfers, The Roman Road was designed by Robert Trent-Jones Senior, opening for playing in 1995, when Celtic Manor was a smaller hotel. Since then the course has mature to one of the best in Wales, hosting the Welsh Open for a number of years. While The Twenty Ten brings people in, The Roman Road is well worth playing in its own right, a great day on any golf break to Celtic Manor. Designed by Colin himself, The Montgomerie Course channels all the experience of the Ryder Cup legend, producing an outstanding golf course. The perfect compliment to the Twenty Ten, that opened the same year, The Monty plays very differently, an undulating layout that affords golfers fantastic views over the Welsh countryside. The deep pot bunkers come into play often and lend a links type feel to the track. The course makes for an exciting round, although it hosted the Welsh Open for a number of years, can be played by golfers of all levels. Since the early 1980s, The Manor House at Celtic Manor Resort has been recognised as one of Wales' finest places to stay and was awarded Egon Ronay's top prize for five consecutive years. The 70 guest rooms and suites have retained the character of the 19th-century property itself, which sits amidst beautifully manicured gardens. Inside the Manor, guests can choose to drink or dine in The Patio Restaurant, the Cellar Bar or Hedley's, the Manor Bar. The Cellar Bar is a particularly popular sports bar with groups, showing a host of live sporting events. Guests of the Manor House have access to the resort’s fantastic array of facilities. For the ultimate way to relax and unwind, head to the Forum Health Club and Spa, offering the some of the best luxury treatments in Wales. As well as the swimming pool, there are saunas, jacuzzis, plunge pools and steam rooms, whilst the state of the art gym boasts 54 workstations and a dance studio. Treat yourself to a hot stone massage or an exotic Rasul Mud Ritual in the Forum Spa, an award-winning facility that attracts guests to the resort itself. It is generally a very nice hotel, great setting on the outskirts of Newport. Most of the staff are incredibly nice and welcoming. Beds are not the most comfortable. Nice a comfortable rooms after a long travel.drinks expensive but just what you expect in these hotels. room very good,could do with a bar that you could just get a snack and some chips,at a reasonable price? I resent having to pay £15 for parking per night. Residents should never have to pay for parking. Also the hotel put a pending change of £50 on our cards. These two factors took away from the experience. Very slow play left after nine holes. The staff at the Twenty Ten were great with us as we were late for our tee time having had train delays from London. The course had drained well given the deluge of rain in the previous few days. The par 3's over water were very enjoyable. The bunkers are well positioned off the tee in most players' landing range. With the weather been very wet the weekend before we got there the course was playing very long with no run the only problem we had was the bunkers had not been racked.buggy good idea on this course. great day ,would love to play the course again,would take different lines off some of the tees.greens were great fun.cheers pete. course was a good standard,we are all low handicap players so we all enjoyed the course. The pace of play was very slow. The group behind always came up to our tee when we were teeing off. The ranger should stop groups from encroaching on players like this. It was very off putting.